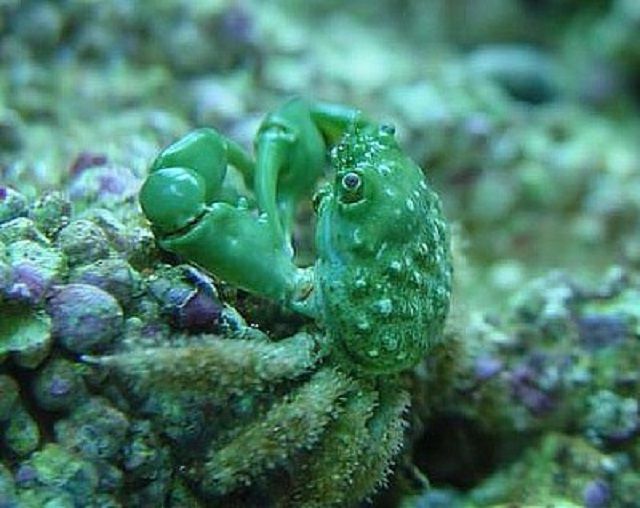 The Emerald Mithrax Crab (Mithrax sculptus) is a very popular crab in the saltwater aquarium hobby. This beautiful green crab with hairy legs is a fantastic little scavenger, feeding on uneaten food and many types of unwanted algae, including Bubble Algae. The Emerald Mithrax Crab (Mithrax sculptus) is found on the reefs of the Caribbean and grows to about 2 1/2" in size. The Sally Lightfoot Crab has long been used as a "reef tank janitor" to help clean the substrate and rocks in saltwater aquariums. As an omnivore, the Sally Lightfoot is the ultimate scavenger, consuming detritus, uneaten food, algae and everything else in its path, with the noted exception of living corals. When this crab gets larger and more aggressive , it will also attack and eat small fish and invertebrates. The Sally Lightfoot Crab has a brown body, with orange to yellow rings on the legs. The Porcelain Anemone Crabs (Neopetrolisthes ohshimai) live in pairs in an anemone, eating planktonic food and mucus from the anemone. It should not be kept in an aquarium with larger crabs as it may not be able to defend its turf. In the wild, Porcelain Anemone Crabs live in pairs in an anemone. It will fend off any invaders to its "house", including Clownfish, which are usually the victors in any conflict. It is aggressive toward other Porcelain Anemone Crabs and should not be kept with larger, aggressive crabs which may attack it. It eats plankton and mucus from the anemone in the wild, but its diets can be supplimetd in an aquarium with tablet food placed near the anemone. The Horseshoe Crab (Limulus polyphemus) is found in North America along the Atlantic and Gulf coasts from Maine to Mexico. Horseshoe crabs are not true crabs at all. They are more closely related to arachnids (a group that includes spiders and scorpions) than to crustaceans (a group that includes true crabs, lobsters, and shrimp). The Atlantic Blue Crab (Callinectes Sapidus) are also known as the Chesapeake blue crab or the Atlantic blue crab. These crabs are strong swimmers due largely to their fifth pair of legs which are shaped like paddles. They are easy to spot with their bright blue claws and olive color carapace. The claws on the adult female blue crab are tipped with red. The male Atlantic Blue Crabs will attain a carapace width of 7-8", with the females measuring a bit smaller. These crabs are predators and scavenge for food. They have been known to eat other crustaceans, recently dead fish, algal materials, clams, oysters, worms, insects and mussels. This crab is not recommended for a saltwater aquarium unless it is the only critter in the tank. The Arrow Crab (Stenorhynchus seticornis) is also known as the Spider Crab. It has extremely long legs and its body may reach up to 10" in length. The most common Arrow Crab (Stenorhynchus seticornis) comes from the Caribbean, but other species are from the Indo-Pacific region, eastern Africa, and the California coast, usually occupying caves. It has been known to attack crustaceans such as Banded Coral Shrimp, and may even attack small slow moving fish. If not fed well, it may attack sick or slow moving fish. It normally a scavenger and It will accept almost all meaty, flake and tablet foods. The Thin-Shelled Rock Crab (Grapsus tenuicrustatus) is found in the Hawaii & the Indo-Pacific. area. It attains a size of about 2" and is abundant on rocks in the splash zone of the reef.. The Guard Crab (Trapezia intermedia) has an orange body with red spots and blue eyes. The carapace width attains 1/2 inch in size. Also known as the Acropora Crab due to its common house being within the branches of the Acropora coral and the Pocillopora coral if no Pocilloporid corals are available. It is believed that it feeds on particles trapped by the coral polyps, fallen detritus, and the coral's secreted mucus. In turn, the crabs guard the coral from invaders and fend off predators. It is found in Hawaii and the Indo-Pacific areas. In an aquarium, this coral crab will require a host SPS coral for survival.